“Are you looking for waterfront? Are you looking for a place to build your dream house? 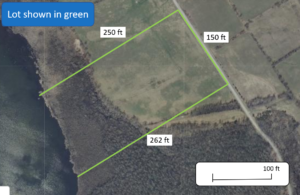 Then look no further than this nature lover’s paradise.” This could be the listing description for any number of vacant lots in the County – just like the aerial photo of the hypothetical listing shown above. However, to avoid a nasty surprise later, you or your buyer agent should do a thorough review of the Official Plan and zoning before making an offer. Waterfront, wetlands and creeks (watercourses) present some special issues. To illustrate: the aerial photo shows a lot with 150 feet of frontage on the road and plenty of depth. It looks like there should be a lot of flexibility in terms of where to build on the property. 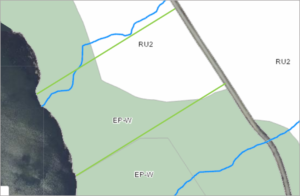 A review of zoning for the property (above) on the Municipality’s Geographic Information System shows that much of the lot is zoned RU2, Rural 2, which allows a home to be built, as long as it’s setback 50 feet from the road and 15 feet from the side of the lot. However, the part zoned EP-W is the fly in the ointment. 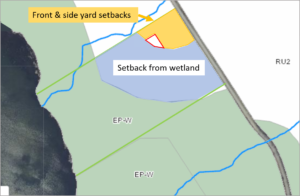 Conservation authority rules prohibit development within 30 meters (98 feet) of the edge of an area zoned Environmentally Protected – Wetland. When the setbacks from the EP-W zone and RU2 zoning are considered, the only place to build is in the area outlined in red. This has been a hypothetical situation, but if you think I’m being alarmist, you should know that twice in the last month I have reviewed similar lots for buyers, only to find that they were “un-buildable”. The moral: before you make an offer on vacant land, much sure you know the zoning, the allowable uses, and the setbacks required from lot lines and environmentally protected areas.